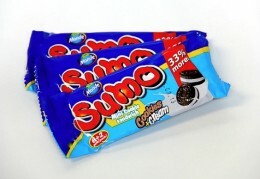 Sumo Cookies are mini cookie sandwiches that are proving popular across school canteens. Each 20g packet contains eight mini Cookies filled with a cookies and cream flavoured centre and two chocolate biscuits top and bottom to make a sandwich. Sumo Cookies are low in saturated fat, salt, sugar and kilojoules. Not only are they excellent to eat, Sumo is priced well too, so the canteen makes a good profit. For more information contact your local school wholesaler or Global Quality Foods Pty Ltd on 02 9533 3351 or admin@gqf.com.au.